At the Bauma 2019, Liebherr introduces its generation 8 crawler tractors with the new PR 736 G8. The new PR 736 G8 is powered by a newly developed Liebherr diesel engine belonging to the EVO series (160 kW/217 bhp). It meets Stage V emissions levels, its exhaust gases being cleaned by a combination between a DOC (diesel oxidation catalyst) and a SCR filter (selective catalytic reduction and particle filter). Alternatively customers in LRC markets have additional engine versions and equipment levels to choose from. The machines' operating weight is up to 25,500 kg. To cover a maximally large application range various blade versions (straight, semi-U and 6 point blade) with capacities from 4.1 to 5.56 cubic metres as well as many rear equipment options are offered. The operator's cabin offers many new features to make work even more ergonomic and productive: For the first time, a grab handle with integrated joystick for the rear ripper is used in the 25 tonne class. This guarantees stable seating when driving in uneven terrain. Fully separating the cabin from the base machine and the noise optimized drive train significantly reduced vibration and further improved the noise spectrum in terms of critical frequencies. Standard climate control keeps a constant cabin temperature even in adverse weather conditions. The new access and descent lighting with delay function which can be activated from outside provides additional safety at dusk. The large 9" display is the new information and control station for all relevant operating data. There, one can, among others, precisely adjust the driving and steering response to one's personal requirements and save them. The main functions can still be controlled by means of haptic buttons and keys. The display is used for configuration and fine adjustments. The new assistance systems on the generation 8 crawler tractors offer three assistance levels: "Free Grade" for active blade stabilization during fine grading, "Definition Grade" for automatic blade positioning when creating 2D grades and "3D Grade" as an optional GPS machine control system to model complex terrain shapes - among others, with the standard roof-mounted GPS/GNSS antennae. 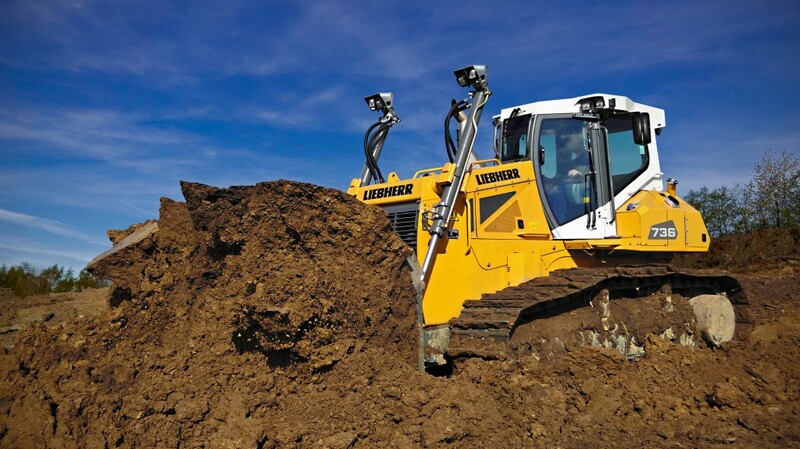 Liebherr Active Sensor Control to stabilize all blade axes is on board as standard. Two independent, permanently mounted integrated sensor circuits (gyroscopic and inertia sensors) allow for particularly high grading speeds and perfect fine grading at all times. The strong electronically pilot controlled work hydraulics allow for swift work cycles at high precision. It can be optimally adjusted to the operating conditions and the operator's requirements. Apart from the hydrostatic drive system, the proactive performance adjustment system and the Eco mode were both taken over from the successful generation 6 crawler tractors. Besides high pushing performance this allows for particularly economical operation. The new 6 point blade with increased capacity (up to 4.84 cubic metres) improves production output and facilitates grading with its optimized linkage geometry. Many wide-opening hatches, central maintenance points and the tilting cabin that comes as standard facilitate daily maintenance and access for inspection purposes. Long service intervals using Liebherr lubricants significantly contribute to the machines' low operating costs. The standard LiDAT fleet management system delivers information on localisation as well as the crawler tractor's operation. This includes the machine's position, operating and usage duration, fuel consumption and service interval information.